16' Shuman Built Boat Tackling Skinny Water In Northern BC. Shuman Built also known as "El De Fabricating" was a local boat builder in the Fort St. John area by the name of Doug Shuman. 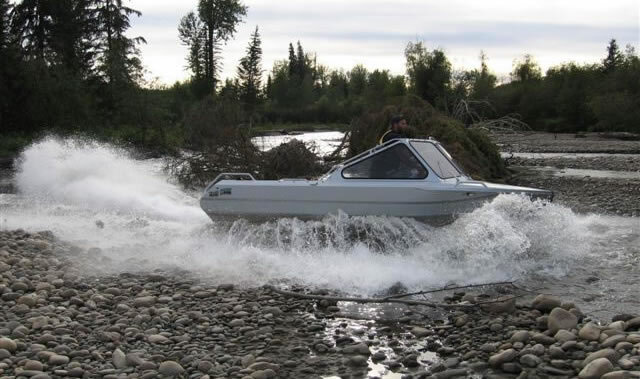 Doug's boats were very well known in the north country as being some of the toughest welded aluminum jet boats out there, built specifically for running the rough and shallow rivers of Northern BC and Alberta. Great for hunting, fishing and family use. These boats were built in very small numbers, by a talented craftsman. They are no longer produced but if you can find a good deal on a used one, you're the proud owner of one of the best built jet boats in BC. Shuman Built boats were custom made boats, they didn't produce production models. You can find them available in 16' to 18' foot, these boats are primarily powered with sportjets. The 19' to 21' foot shuman built boats were often powered with small and big block V8's. Mailing Address: no shop location.